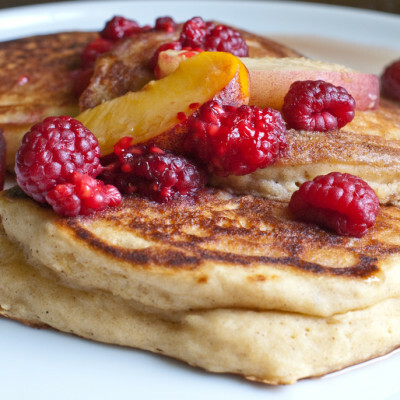 The maple syrup infused with sweet raspberries and ripe, juicy peaches makes your pancakes look like something you ordered at your favorite restaurant or bed and breakfast and taste amazingly fresh and delicious. 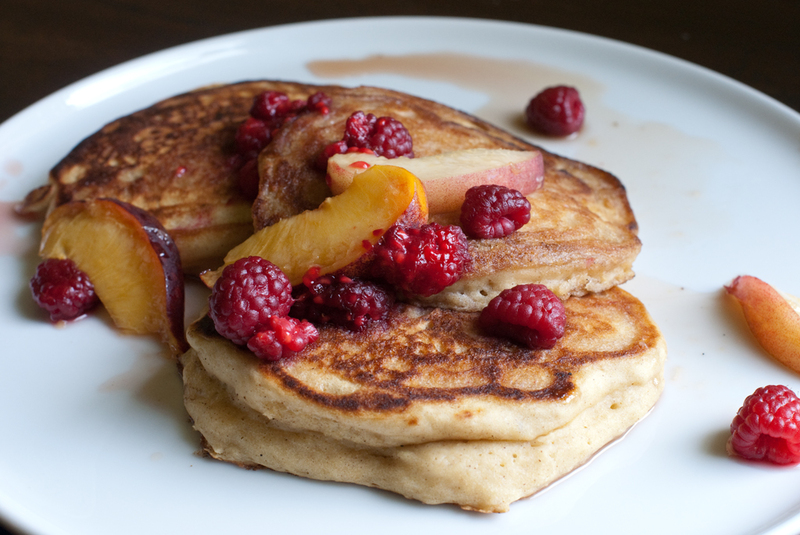 These peach puree pancakes are incredibly light and fluffy and I even used an egg replacer. They can also be Vegan by using coconut oil instead of butter to coat the pan. My husband could not taste any of the coconut oil in the batter so do not worry about too much coconut flavor. After seeing how much easier it is to weigh the ingredients with a scale when baking the Pecan Sandies from Bouchon Bakery, I went ahead and weighed all the ingredients for you and for me to make next time. They were so good my kids will be asking for them again this week. If you do not have a scale then I included the cup and teaspoon measurements too. There are several reasons measuring with a scale is better. 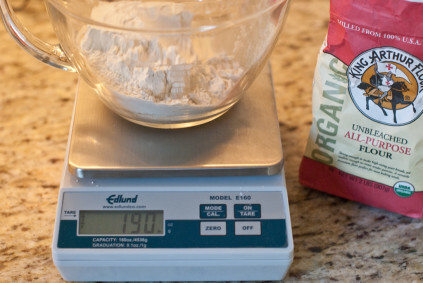 One, there is less room for error when weighing flour, salt, and other ingredients that can drastically vary in weigh due to if you are scooping or pouring straight into the measuring cup. Second, it is easier to clean since you use less bowls and cups. Plus, if you are using sticking things like honey or molasses, you pour all the sweet goodness in the mixing bowl and do not have to clean a measuring cup! All you need to do to measure is place the bowl on the scale, hit tare, then pour in the first ingredient, tare, then add another ingredient. It is that easy. 1) Add all the dry ingredients into a bowl and mix together. 1 cup all-purpose unbleached flour (190 grams), 2 tablespoons cornmeal or stone ground corn flour (22 grams), 1 tablespoon cane sugar (11 grams), 1 teaspoon aluminum free baking powder (4 grams), ½ teaspoon baking soda (4 grams), 1/2 teaspoon ground cinnamon (1 gram), ¼ teaspoon Hand Harvested Fleur de Sel salt (1 gram). 3) Pour the wet ingredients into the bowl with the dry ingredients and mix. It will still be a little lumpy and look very light and airy. 4) Heat your cast iron skillet to medium. Water droplets will dance across the skillet when it is hot enough. Add the coconut water or butter to grease the skillet. Pour in the batter to make small or large pancakes. When the pancakes start to bubble on the edges, flip them and cook another minute or so until they are done in the middle. If your first batch is too brown, turn down the temperature of the cooktop. Make sure you add oil or butter each time you add more pancakes so they do not stick! 5) Place a pyrex dish on the skillet and heat up 1/2 cup of maple syrup. 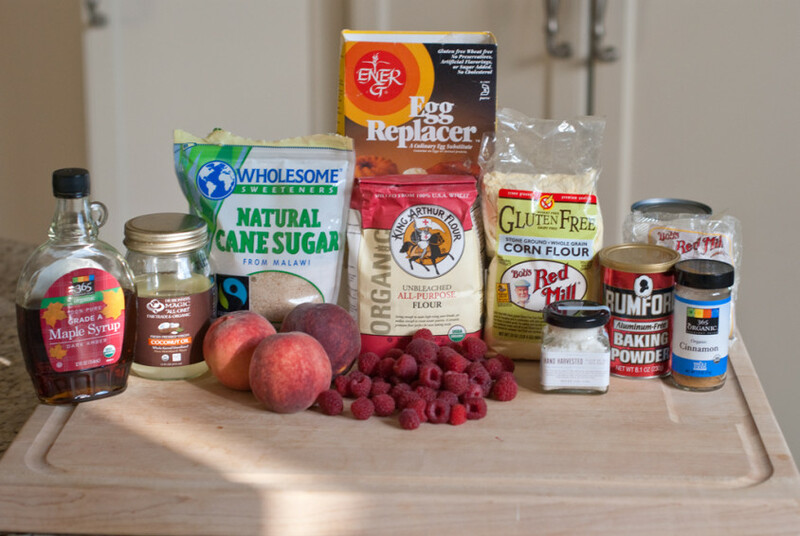 Add the 1 cup of fresh raspberries and 3/4 cup of thinly sliced peaches. Warm the fruit. If you do not have room on the skillet, use a saucepan to warm the syrup and fruit. Pour the syrup over the pancakes and spoon the fruit over the top. Serve warm. Enjoy! In a bowl, stir together flour, cornmeal, sugar, baking powder, baking soda, cinnamon and salt. Make a well in center of dry mixture; set aside. In another bowl, combine milk, Peach Puree, egg and cooking oil. Add milk mixture all at once to the dry mixture. Stir just until moistened (batter should be lumpy). For each 2-inch pancake, pour about 1 tablespoon batter onto a hot, lightly greased griddle or heavy skillet. (For 4-inch pancakes, use about 1/4 cup batter.) Cook over medium heat about 2 minutes on each side or until pancakes are golden brown, turning to second sides when pancakes have bubbly surfaces and edges are slightly dry. Serve warm with Peachy-Berry Sauce. Yield: about twenty (2-inch) pancakes (5 servings). Place peaches in a food processor bowl or blender container. Cover; process or blend until smooth. Per serving without sauce: 209 calories, 8 grams total fat (2 grams saturated fat), 46 milligrams cholesterol, 343 milligrams sodium, 29 grams carbohydrates, 1 grams fiber and 6 grams protein. In a saucepan, bring maple syrup just to a simmer. Stir in raspberries and peaches; heat through. 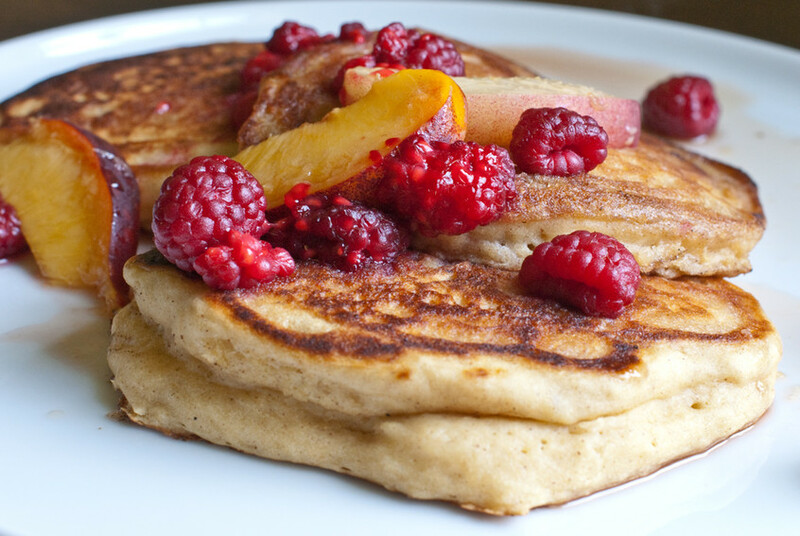 Serve over Peach Pancakes. Yield: 2 1/2 cups. Per 2 tablespoons: 152 calories, 0 grams total fat (0 grams saturated fat), 0 milligrams cholesterol, 2 milligrams sodium, 13 grams carbohydrates, 1 grams fiber, 0 grams protein.